It’s hard to photograph beige food. No matter what you do when you photograph it, it just looks … beige. And that’s a real shame when it comes to a recipe that tastes as amazing as this one. You may remember that a few weeks ago, I discovered how delicious farro is, and how easy it is to prepare. So this recipe for farro risotto with roasted cauliflower and gruyere was next on my list to try. If anything, I like it even better, despite its rather pale and timid appearance. So think about this meal as the equivalent of the wallflower at a party. It may not be the recipe that makes you do a double-take, but it just might make you happy for the rest of your life. Spread the cauliflower on a parchment-lined baking sheet, and coat in 2 Tbsp olive oil. Sprinkle with salt and pepper. Roast for 20-25 minutes or until browned and crispy, tossing once halfway through. Set aside. Stir in the cauliflower and the cheese. Season to taste with salt and pepper. Serve warm. yes I know what you say Beth but I love cauliflower ! I have to try this recipe! I hear you on trying to take a pretty photo of brown or tan foods! But as a farro and cauliflower fan, I know this is a winner!! Yes, this doesn't look so pretty but it sounds yummy. And good to have something new for cauliflower. I definitely have a problem with delicious, ugly food! I actually love the rustic look of beige food :-)) And this looks really comforting and delicious, Beth. I've been back on the farro wagon lately, too, Beth. I'm cooking it and tossing it with roasted grape tomatoes and a little sherry vinegar…so good. Love the texture. This looks wonderful! the only thing better than farro is CHEESY farro! this sucker doesn't need color to be completely appealing to me! Beth, you are 100% right. Brown and beige food take longer to be photographed they are not photogenic :). I've never tried farro before but heard a lot about it. This seems to be a delicious recipe to start with. I have such a difficult time styling and photographing food. 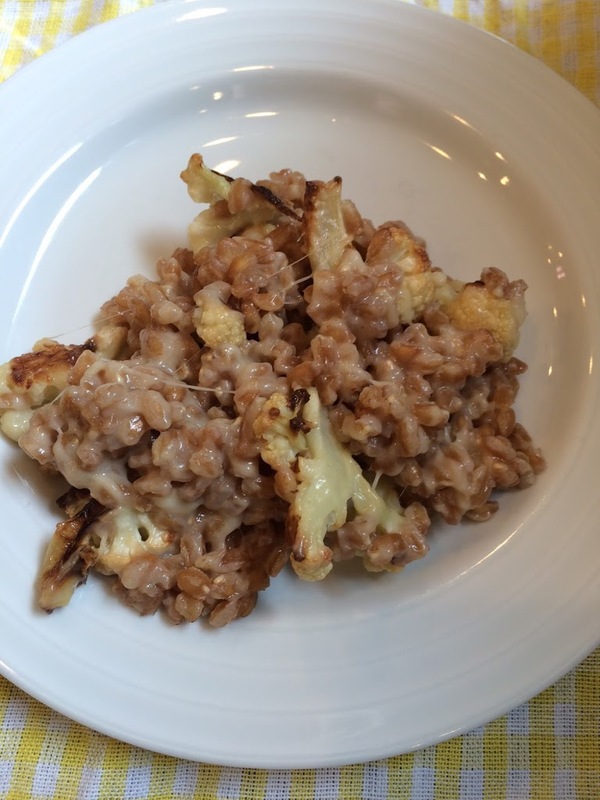 Farro is such a wonderful nutty grain and I appreciate getting another recipe from you. I will try it soon. This looks over the moon delicious Beth, will be making soon. I have a hard time photographing food, sometimes taking over 50 pics to get it even half right. That does look like a challenging subject! In cases like this I add garnish, and basically shoot the garnish. 🙂 Anyway, the recipe looks wonderful — I'd love this. Thanks! Styling and photographing rustic food is really challenging. But you did you a wonderful job, Beth. This one surely looks appetizing and inviting. No worries, Beth, the deliciousness comes across. I really need to buy some farrow – this sounds delicious! This sounds SO GOOD! 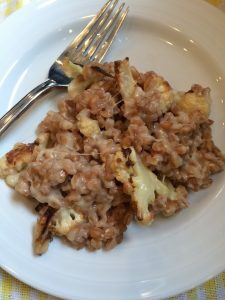 Cauliflower and gruyere in a risotto, perfect. I do love farro and I also love cauliflower. Seems like a great combo and I'm all for good food, no matter how it looks! This does look good–like the comfort value of mac n cheese but healthier! Welcome to Of Muses and Meringues. Thanks for stopping by! I am Beth! 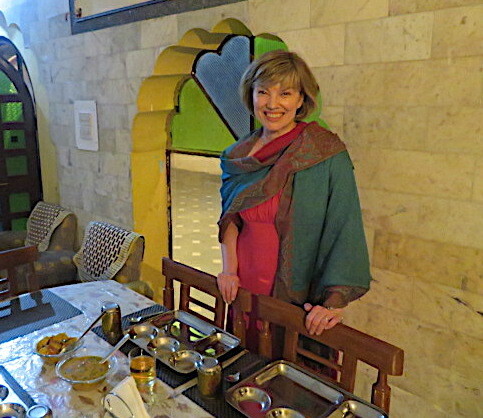 Writer, traveller, baker, mother.